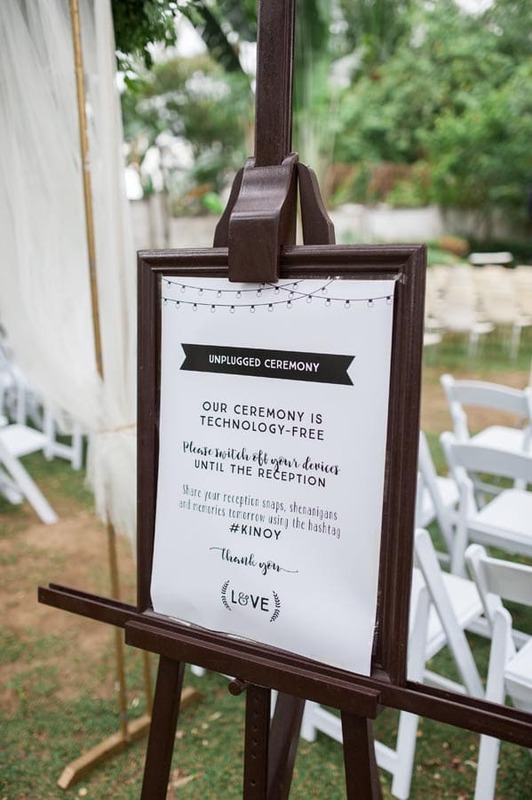 Indicate to your guests that you are having an “unplugged ceremony” and don’t want photos taken with this beautiful sign. (Learn what an unplugged wedding is all about here). Once you submit your order, you’ll receive an email with an electronic form to submit your signage details. You can find out more information about the design and order process here. 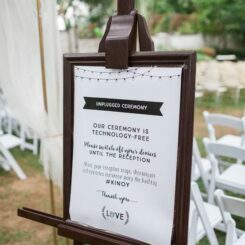 Indicate to your guests that you don’t want photos taken during the ceremony with this beautiful sign. You can select a number of different sizes and printing options to suit the space, wedding budget and timeframe that you’ve working with. How long will my signage take? Please order two weeks prior to when you need to receive your sign i.e. If you need your sign to be with you 2 days before your wedding, then you need to order 2 weeks and 2 days before your wedding. If you need your sign a week before your wedding, as you’re travelling, then you’d need to order 3 weeks before the wedding (or, be prepared to pay the urgency surcharge to get it to you in time). Weddings close to holiday weekends, Easter and January weddings need to allow extra time as printing and deliveries will be held up by public holidays (printer closes late Dec to early Jan). Any urgency fees necessary will be charged separately after your order has been received and your unique situation is considered (the timeframe, time of year, courier requirements, design requirements etc). Purchase a printed version, either printed onto a fine/light canvas stretched onto a pine frame, or printed onto high quality paper and delivered rolled into a cardboard tube, ready for you to frame.